A very cool looking movie, the plot isn’t great, but the visuals make this movie a very enjoyable experience. A pretty decent movie about a robot who is taken in by some gangsters, but is also watched over by his creator. The film has a lot going on, including a hip hop tone and music, a rival villain (played by Hugh Jackman,) who is about as cliched as you can get, and some political maneuverings at the weapons manufacturing company that signs off on building these robots. The talented cast, which includes Sigourney Weaver and Dev Patel, helps, but the story is pretty average, and the action is nothing special. It’s cool at first, seeing these robots in full effect, but after that, in terms of action, we really just end up waiting for Jackman’s character to bring out his big robot, the Moose. And that only happens for one scene. The movie is enjoyable, but could have also been a lot better if it had maintained its focus, and given the audience more of what they wanted. Chappie is the third movie by Neil Blomkamp, the man who is quickly becoming known as the futuristic robot guy. Where was this dude when they made Real Steel, a few years back? Of course, that movie was strictly about robot boxing as a sport, whereas what Blomkamp does is make politically charged action pictures that feature robots. His first movie, District 9, which is by far his best, was a futuristic take on Aparteid in South Africa. His next film, Elysium, was all about medical plans, and the rich vs. the poor. Now, with Chappie, Blomkamp has made his simplest film to date, and in many ways that is not such a bad thing. It certainly avoids all of the beating us over the head with the preachy message elements that Elysium had going on. The action is also a lot better in this movie, then it was in that film. And yet neither the storyline, nor the characters, nor the action, is anything great, in a movie that really needed one of those three things to stand out. Moore has come up with a robot of his own, which he calls Moose. He tries to get the CEO of the robot engineering company, Michelle Bradley (Sigourney Weaver,) to sign off on these. She lets him present it to the police, only they are not interested. They are very happy with the Scout robots and don’t see a reason to try anything else, which could possibly replace them. If it’s not broke, don’t fix it. Clearly this is all leading to Moore doing something that causes the Scout robots to no longer be so great, to either look like a threat, or like they can’t do their jobs. Something that will make Bradley give his robot a try. There’s the story of the competing robot engineers and then there’s the story of a gang that gets their hands on one of these Scout robots. It all starts with Chappie in action, getting a little damaged, and going in for repairs. Chappie has some problems with his robotic hear and he gets his black ear replaced with an orange one, giving him a mark that allows this robot to stand out when with the others. Think of it like Finn getting a bloody handprint on his stormtrooper mask at the start of The Force Awakens so that the audience could differentiate him from the other stormtroopers. Now, this orange eared Chappie goes out with other Scout bots to stop a gang war. Chappie gets blown to bits during this outing, so much so that the company declares he can no longer be salvaged. That’s when Deon gets his hands on him. Deon wants to teach the robot to judge art and write poetry and make paintings. He wants the robot to be just like a person. Unfortunately he works for a weapons company, and Bradley reminds him of that when he proposes his idea to her. Deaon ends up stealing Chappie frrom the site, and all is going well until the gang members decide to kidnap Deon. They want him to give over a switch which will turn all of the robots off. Deon says no such switch exists, but he repais and gives them Chappie instead. Deon leaves Chappie with the gang, with plans to come back as often as he can to check up on him. He becomes like the robots father, and one of the gang members, Yolandi, becomes the caring mother. The other two gang members are like the abusive uncles. These are Ninja, (the leader,) and Amerika. At one point, Ninja is unhappy with the lack of training and obedience that Chappie is able to show, and he takes Chappie to a park that is occupied by drug addicts, dealers, and gangsters. 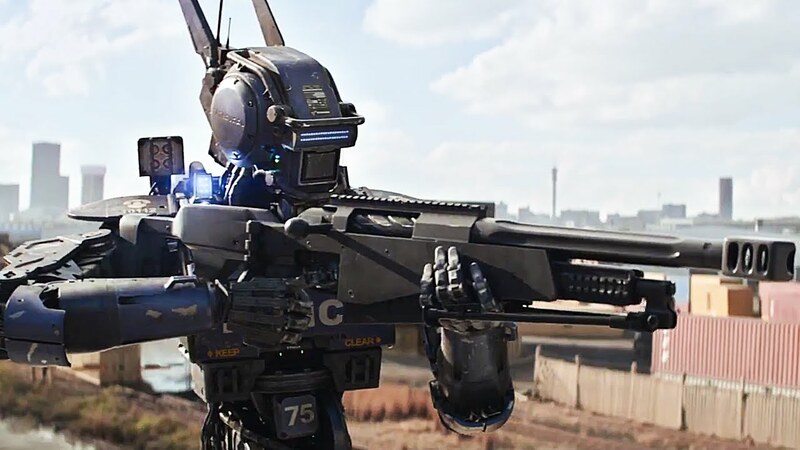 Chappie, of course, still looks like a police robot, and the punks who occupy the park go to town, beating him. When Chappie returns home, Ninja has some remorse and promises to be better to Chappie from this point forward. Of course it is all fake, and he really harbors the same angry feelings to the robot, about not getting what he wants and taking it out on the machine. When Chappie was left in that park and the kids there were done with him, Chappie ran into another problem. Moore got wind that Chappie was around, walking the streets, and he drove up in a van and kidnapped him. Moore then stole a chip out of Chappie’s head that would help him be able to reprogram not only Chappie, but all of the Scout robots. And that’s exactly what he does. There’s really no surprise here, as it is the kind of thing we were able to predict from early on. Especially with the way they kept showing us the Moose robot, just sitting there. It was obvious that we would see this robot in action by the end. You don’t introduce a gun in act 1 unless you plan to use it in act 3. That’s the oldest lesson in the screenwriting handbook. Luckily, a lot happens in the climax. The Moose is on the loose and he attacks, and a number of major characters are killed. As if that wasn’t enough, there’s a whole bunch about transferring the consciousness of a person into a robot, or the consciousness of one robot into another robot. At least two humans have this happen to them, and Chappie tries to do it to himself as well, getting his consciousness into another, newer robot. It ends up being a lot saved all for the ending. On the one hand this is good, because it is something that we did not see coming, and totally unpredictable. On the other hand, it is so much happening all at once, that the movie would have been a lot better if these transferring of conciousness ideas had been spread out a little more. 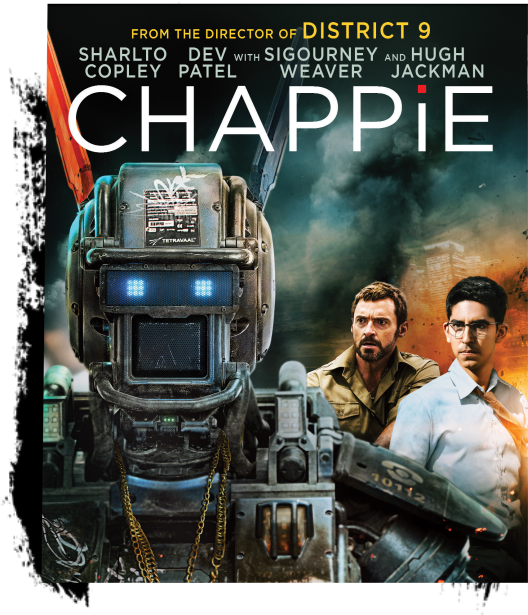 In some ways Chappie works as a movie, but in many others it does not. The idea to combine two different storylines, one about competing inventors, and another about a gang who takes on a robot as a sort of child and tries to teach him, is a good one. It’s nice to have two different storyliness running at once, each with its own set of characters and villains. The only downside is that neither one of these stories is anything special. The Moore storyline in particular is very much like others that we have seen before, and just a little too simple and predictable. Even the Moose robot looks like the giant killing machine that is the competition in the original Robocop film. 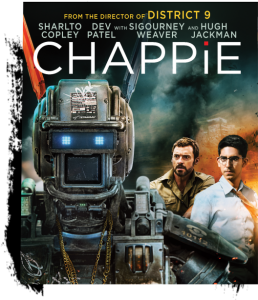 While neither story in Chappie is especially great, the combining of them (let’s say two half stories,) to make one whole story is a pretty good idea. They each have qualities that make up for the faults in the other one. Hugh Jackman and Sigourney Weaver as characters at the robot manufacturing company, are great. Their roles might be two dimensions and cliches, but it’s always nice to see such talented actors, and they have a real presense here. The movie handles its action nicely, which is definitely a step up from Elysium, which kept putting the action into slow motion. The only problem is that there’s not quite enough of it. The real action only gets started toward to end of the film, and while it is fun, it definitely left us wishing there had been more of it. Consider it the same problem as the movie has with the downloading consciousness storyline. It’s great when it shows up at the end, but would have beena a lot better if sprinkled throughout. Chappie is an enjoyable movie that definitely has its flaws.